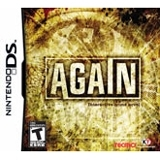 Again for DS... Beware of Your Past - Tap through the suspense in Again, an interactive crime novel from the makers of "Hotel Dusk", only on the Nintendo DS. Follow the clues as FBI agent Jonathan Weaver, using Past Vision powers and navigate through factitious adaptation of an early 90's crime-ridden New Jersey. Nineteen years after the first Providence Murder Cases, your goal is to track down the assailants, using evidence found along the way. As the only survivor of his family's murder, Weaver has been pursuing numerous unanswered questions in his unwavering search for the killer realizing just how the past can come back to kill you.